SAJ has provided this Ecover floor soap review, which she uses to clean her tile floors. 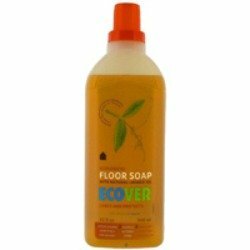 I use Ecover's product to clean the tile floor in my bathroom as well as the kitchen. I originally bought this product because it was the only one at the store that said that it does not test on animals. It has a light citrus scent that smells almost like candy. It's foamy just like soap when adding water to make the solution, so it's best to not turn the faucet on high. However, the foam goes down quickly. On occasion my children will spill something and not wipe it up and later I find either a dry or sticky mess that takes a bit of scrubbing to clean, but this product does the job. After I started using this, I noticed that it works quickly at getting the mess clean quicker. It also dries quickly and for me, that's a big plus because it seems that every time I mop, I almost immediately need to walk across the freshly mopped floor and I'm prone to slipping. Thanks SAJ for your Ecover floor soap review. I have kids of my own, so I definitely know what you mean about kids spilling, especially in the kitchen, and not cleaning it up. I'm glad you've found a product that works well for you for cleaning up those mystery spots and spills and stickies that seem to appear on our floors. Does anyone else like any Ecover products? If so, please share your house cleaning supplies reviews here, telling me what Ecover product, or other cleaning products you like, and why. In addition, you can share your own tile floor cleaners review here, to tell me what products you like to use to clean your tile floors. Join in and write your own page! It's easy to do. How? Simply click here to return to natural floor cleaning supplies.